Pumpkins at a roadside produce stand. This fall, plan a trip to Longwood Gardens in Chester County, about an hour from Philadelphia, where there are more than 1,000 acres to explore. As the seasons change, so do the gardens, meadows, woodlands and horticultural displays. Autumn is one of the most beautiful times to visit Longwood, as shades of red, orange and yellow begin to emerge. The pumpkin-filled play area will open for the fall season on Saturday, Sept. 29. 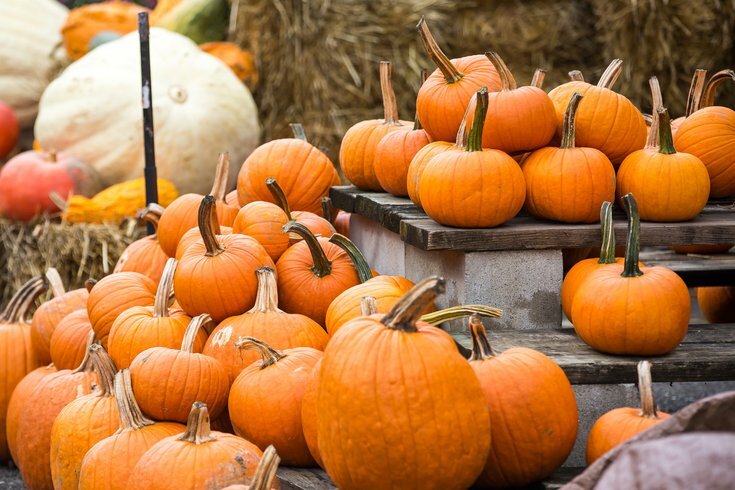 There will be hands-on activities and children can pose for a photo with a pumpkin that weighs 700 pounds. September and October will be the last months to view this year's Main Fountain Garden performances. Illuminated fountain performances will end Saturday, Oct. 27, and daytime fountain performances will end the following day. During the illuminated shows, water in all shapes, sizes and heights is combined with music and colored lights. For each performance, there's a different musical theme. Families with kids may want to check out the show on Friday, Sept. 28, or Saturday, Oct. 6, when Disney songs will be played. The playlist includes favorites from "The Little Mermaid," "Moana," "Beauty and the Beast," "The Lion King," "Aladdin" and more. The Chrysanthemum Festival will begin Thursday, Oct. 25. For the annual event, more than 17,000 chrysanthemums are trained into giant orbs, spirals, columns, pagodas and – new for 2018 – a fan. The "Thousand Bloom Mum" will also be unveiled in late October. It's a single plant bearing more than 1,500 blooms on one stem. On Thursday, Oct. 4, the Garden Railway will re-open for the season. Kids can watch miniature locomotives chug along nearly 400 feet of track.